Posted February 13, 2012 by Jeff V.
Posted January 11, 2012 by Jeff V.
Microsoft’s head of software design for Windows Phone has admitted that the company completely redesigned its mobile operating system platform as a response to Apple’s iPhone and the “sea change” it created in the industry. According to the report, “once the iPhone exploded into the marketplace, Microsoft executives knew that their software, as designed, could never compete.” In December 2008, Microsoft’s then head of mobile engineering called a meeting to decide the fate of its aging Windows Mobile software. Seven hours later, Myerson and his team decided to scrap the OS and start again from scratch. One could argue extremely cogently that everything that has happened in the last five years in the mobile market was in response to the iPhone. Posted January 5, 2012 by Jeff V.
Note the iOS 5 launch line — that’s when iMessage was introduced. This matches my experience directly. Almost everyone I message frequently has an iPhone, and my sending of actual text messages has dropped massively. It’s to the point where if I see the green message button/bubble (which signifies text messaging), I’m actually surprised. 90% of what I send uses iMessage’s blue buttom/bubble. iMessage absolutely cannibalizes traditional text messaging usage. For you BlackBerry users out there, think of iMessage as Apple’s version of BlackBerry Messenger (commonly called BBM). I love this trend. Not for me alone, but for consumers. As it stands today, wireless carriers price text messaging at astronomical levels, especially considering there’s no magic voodoo involved. It’s old technology at a premium price, and it’s almost all profit for wireless carriers. iMessage sends information using your plan’s data pipe, and has the added benefit of confirming message delivery and showing when your correspondent is typing. And it’s free. It can save you money per month. Value add. If you’re an iPhone user and you haven’t enabled iMessage, you’re missing out on potentially being able to save a few bucks per month by reducing your text messaging plan. To enable iMessage on your iPhone, go to Settings -> Messages -> and flick the iMessage switch to ON. Easy. Posted October 10, 2011 by Jeff V.
SlideShare, the website for sharing PowerPoint presentations and other documents, has had a major makeover. The company has ditched Adobe Flash technology entirely, and rebuilt its website using the HTML5 markup language, SlideShare co-founder and CTO Jon Boutelle will announce at GigaOM’s Mobilize conference Tuesday. This means that SlideShare is now viewable on every kind of mobile device, from iPads to iPhones to Android devices and beyond. Another perk is that the website is now 30 percent faster and its files take up 40 percent less space than they used to. Search engines can now read the content within SlideShare slides, meaning that presentations hosted there should start to get much higher page rankings on sites like Google. Text within documents can now be copied and pasted, as well. Another Flash casualty lost to HTML5 and the prevalence of Apple’s iOS. And platform technology notwithstanding, look at that list of downstream benefits: slide content now exposed to search spiders, full mobile device support without clumsy plugins, smaller files, slide text copy/paste. Flash is being marginalized daily. Posted September 14, 2011 by Jeff V.
With Adobe Flash Media Server 4.5, media publishers now have a single, simple workflow for delivering content using the same stream to Flash-enabled devices or to the Apple iPhone and iPad,” Adobe said in a statement. Flash Media Server 4.5 allows publishers to stream Flash content to iOS devices, which means support within the iOS Safari browser is not required. Instead of relying on a device’s processor to render the stream, which often degrades battery life and slows a device down, Adobe’s Flash Media Server 4.5 does all the legwork. Translated from Geekese to Realworldish: the new Flash Media Server will send HTML5 video to iOS devices. It will also send pure Flash-wrappered video to other devices that support native Flash. Let’s say that one more time: the new FMS will not send Flash to iOS devices, but HTML5 video, which is what Apple has been arguing for and embracing since it got into the mobile game with iOS as an operating system. Translated yet one step further: this is Adobe supplicating, knowing full well that iOS won’t be supporting Flash anytime soon. So why do this? Easy: the iOS market is too big to ignore. You have to build inroads to it lest it start eroding your product’s marketshare based on its sheer size. Had Adobe not done this, HTML5 would still be served en masse to iOS devices, just not by an Adobe-powered server. Posted August 19, 2011 by Jeff V.
Posted March 18, 2011 by Jeff V.
Gmail power user? If so, check out Smart Labels, new from Google Labs. This is the logical extension of Gmail Priority Inbox, released last year. Speaking of the iPad 2, the Smart Cover is getting a ton of press. iFixit has the skinny on how it works: “There are a total of THIRTY ONE magnets within the iPad 2 and Smart Cover: 10 magnets in the iPad 2, and a whopping 21 magnets inside the Smart Cover. They’re the reason why the cover works so well with the iPad 2.” Someone cue the “Magnets. How do they work?” meme. Firefox VP on the future of Flash. Slate’s alternative NCAA brackets — you can pick the school color version, or the mascot version. None of that pesky ‘information’ people like to use to make ‘informed’ decisions so they can ‘win’. Bah. Kick it old school and go with your gut! From a random find on Wikipedia: The Cotard Delusion. Scary and fascinating at the same time. Humans, monkeys and most other primates age the same way. So much for the notion that humans age more slowly. This man, a ‘Tough Mudder’, is my hero. I am not kidding. 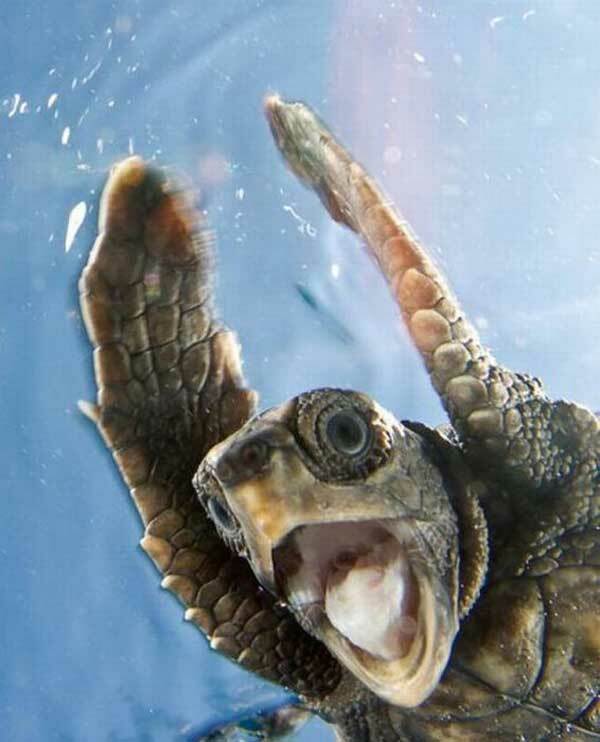 A very excited turtle. What else do you need to know?